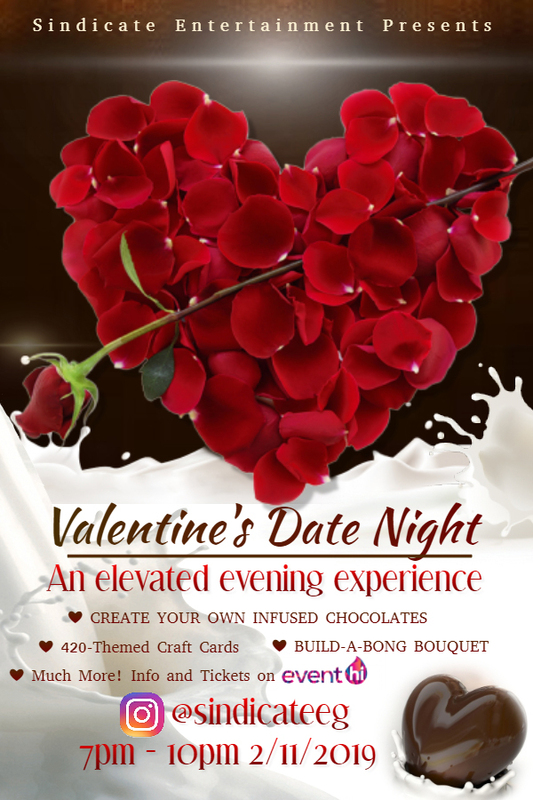 Cannabis-friendly, interactive private event will focus on targeting couples for the upcoming Valentine’s holiday as well as singles with a “Ready-To-Mingle” area specifically designed to encourage interaction. By providing interactive services and live entertainment, the event is unlike many standard pop-up events styled like swap meets, but rather seeks to build a social environment in a cannabis-friendly atmosphere. Event Time: 7:00pm-10:00pm with vendor setup accessibility as early as 5:30pm. Cost: $40 ticket for couple’s ticket, upgradable to $60 couple’s VIP ticket. $30 Single’s ticket upgradable to $40 Single’s VIP ticket. Create your own infused chocolate: Chocolate container/fondue fountains housing milk chocolate, dark chocolate, and white chocolate infused by @TrueTerpenes and @Saint_Polos_Meds. Chocolate will be available for patrons to pour into tray molds (8 count) and heat to set while conducting additional activities onsite. Once set, the chocolates will be placed into a small bag for transportation with the patron at the end of the event. Optional VIP upgrade allows for an additional tray mold (8 count). Build-a-Bong Bouquet: The build-a-bong bouquet is a small glass bong treated as a vase for this activity. An assortment of flowers will be available to allow the patron to arrange a bouquet in the bong, allowing them to take both a functional piece home as well as enjoy a handmade arrangement. Optional VIP upgrade to event allows some flower of choice to also accompany the bouquet. Gamer Lounge: Provided by @blacklistgamerlounge. The gamer lounge is a consumption friendly area allowing patrons to enjoy some of the latest game titles on current systems such as PS4, Xbox One, and Nintendo Switch. A great alternative option for entertainment onsite for those with a competitive persona! Crafting with Cannabis: Construct your own personal Valentine’s Day card to accompany the additional onsite gifts with various arts and crafts materials, assisted by @floral.perception and @gypsea_rebel. Tarot Readings: Measure potential outcomes and evaluate influences with taromancy by @gypsea_rebel. Onsite Massage Services: A relaxation option available at a rate of $1/min, the onsite massage allows patrons to have a stress relieving alternative to consumption onsite. **Optional VIP upgrade allows for a free 10 minute massage. Infusion Optional Meal: Provided by @saint_polos_meds and @cannabischefunion. Optional infused evening meal available for purchase onsite. **VIP upgrade option free meal of choice with option to infuse.